Finance defines the structures and business rules in the Modeler. Next, the person or people responsible for the budget process make up an initial budget, usually a combination of actual figures from the current year and a forecast for the remainder of the fiscal year. Finance then makes a few adjustments, such as indexing revenues and costs, modifying the volumetrics, etc., in order to finalize the so-called proposed budget. This proposed budget then becomes the one that is decentralized to managers, who, in turn, will make any necessary adjustments. 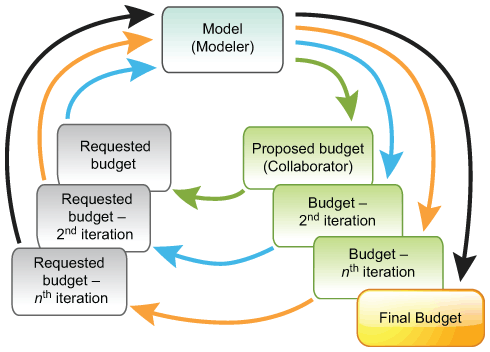 The following diagram shows how an organization that has 9 months of actual data and 3 months of forecast data ends up with a proposed budget. In fact, this proposed budget is only a starting point that managers will adapt to their different situations. When each of them is satisfied with their budget, that version becomes the requested budget. The Decimal Suite allows managers as well as the Finance team to compare any changes between the proposed and requested budgets. Management reviews the requested budgets and makes any necessary adjustments. Where required, Finance can repeat this process. If it decides to do so, the requested budget and the adjustments introduced by Finance become the new proposed budget. Managers adapt the new proposed budget to their different situations and, when they are satisfied with the result, that version in turn becomes the new requested budget. The iterative process is extremely fast: since data is stored in a centralized database, changes are immediately available to all employees if (and only if) their security profile allows them to access the data. In fact, administrators can restrict or block any user’s access to data. For example, the system is generally configured so managers can only access their own cost centres. However, an executive may have access (in read-only mode) to all the cost centres under his or her control. It is also possible to freeze or hide certain accounts that only Finance can modify.